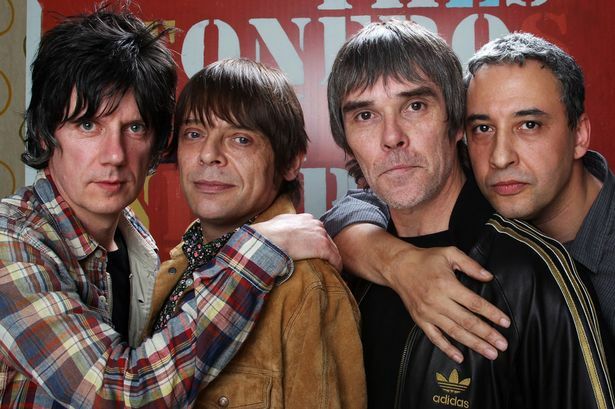 Manchester’s Stone Roses have released their first new music in twenty one years – and it has divided the nation within hours of its release. Oddly, people who like the Stone Roses like it and People who don’t like the Stone Roses hate it. Go figure. Music is a funny old business. The more successful a band the more people get passionate about them. Fans of a band will make an effort to like things that are not as good as the stuff that got them into the band in the first place. People who do not like a big name band will, rather than just ignore them, go out of their way to be hostile about them. Then of course, you have to throw into the mix the ‘following the crowd’ factor. There have been some really dreadful bands that have reached the dizzying heights of headlining stadiums and festivals purely because the media have made them out to be cool. So where do the Stone Roses fit into this? Back at the tail end of the last millennium guitar bands started reinventing themselves for the post rave world. Traditional ‘indie’ was shone through a psychedelic kaleidoscope and given a funky beat. For a brief period the mainstream world of pop was littered with half decent tunes. As is the way though, the ‘industry’ milked it for everything they could and signed anything with baggy jeans and a swagger. In the process some truly awful bands were elevated to stadium superstardom. The Stone Roses stood head and shoulders above their peers. And it was with good reason they were so far ahead of the pack. In their midst they had some gifted musicians and an awareness of how to create an atmosphere and a vibe with their music. They stole from the past, mixed and matched the best bits from sixties psychedelia, seventies punk attitude and eighties dance music. Attitude and shrewd marketing can, and often does, elevate a band far above the status they really deserve. But in the Roses we had a rare case of music that warranted being elevated. Yes, there are scores of bands out there that are better than the Roses that nobody has heard of, but of all the bands that have made it big in the last thirty years, none of them deserve it as much as the Roses. Their entire career was dogged with controversy which, for any other band would have overshadowed their music. They fell out with their first record company and ended up throwing paint all over their office; they appeared on the BBC Late Show and the power cut off in the middle of their set; they took forever to release their second album and guitarist John Squire broke his collar bone in a cycling accident putting an end to what could have been their career defining headline slot at Glastonbury. Welsh fans will remember that they caused a riot in Newport when singer Ian Brown pulled on a Cardiff City top someone in the crowd had thrown to him. Yet despite all the controversy, the thing everyone remembers about the Roses is their music, two albums and a string of singles that defined a generation. They fell apart, rather than split, back in 1995 and nobody really expected them to ever come back, but come back they did in 2011. Since then there have been a series of high profile gigs and much talk of new material, but no actual material. Until now. On 12th May the new single, ‘All for One’, was debuted on Annie Mac’s Radio One show and made available for digital download immediately after. The all important question is – is their legacy still in tact? And quite simply, the answer is yes. Musically it sits somewhere between the first and second albums. Sixties psyche on steroids with layers of harder edged guitar on top. The studio magic has been worked on the vocals again but for some reason it does not sound like the Ian Brown of old. Critics have picked up that the lyrics are meaningless, but this is a little churlish, they have never tried to be Bob Dylan. it is the music that is the important thing here. Comparisons to their early work are inevitable and it will take a while to decide if it is going to be a future classic (probably not), but it contains the trademark psychedelic sprinkles and echo and an all too brief killer solo from the man Mr Squire. Take the comparisons against their own work out of the equation and we have one of the best tunes you are likely to here on mainstream radio this year. Granted, it is not the best record that has been released this year, not by a long chalk, but it is the best to come from a ‘big’ band. No competition. But it is not enough. WHERE IS THE BLOODY ALBUM?